A court rules that Rachel Corrie caused her own death by intentionally remaining in front of an IDF bulldozer. Her lawyer will appeal. A Haifa court ruled Tuesday morning that Rachel Corrie caused her own death by intentionally remaining in front of an IDF bulldozer. Her lawyer said he will appeal the decision in the civil lawsuit. Judge Oded Gershon supported the IDF claim that the driver of the bulldozer could not see Corrie, who was protesting the 2003 demolitions of structure in Rafiah, Gaza. The court noted that the case of Corrie is sad but that the young woman, who was 23 years old, was fully aware that she was in danger and that she could have prevented her own death by moving out of the path of the bulldozer. Judge Gershon found the IDF free of blame and said it did not act recklessly. Corrie was protesting with the International Solidarity Movement (ISM), whose members have often worked with Hamas and Islamic Jihad terrorists to help them hide from Israeli security personnel. Corrie’s father said two years ago, "The more we found out, the more likely that the killing was intentional, or at least incredibly reckless. As a former soldier, I was even in charge of bulldozers in Vietnam ... You're responsible to know what's in front of that blade, and I believe that they did." The soldier who drover the bulldozer testified behind a partition to prevent his identity from being known. The Haifa court accepted his testimony that his vision was impaired by a pile of rubble. 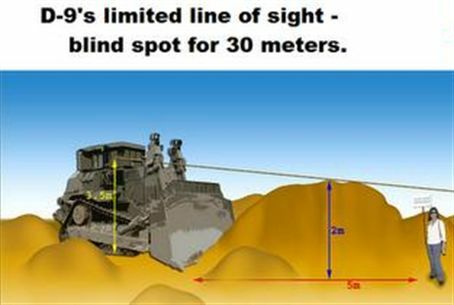 Because of the size of the bulldozer, it is difficult to see what is in front of the blade when it is on the ground and close to its object. Commenting on the decision, a government spokesman said, “The action described in the suit was ‘a military action in the course of war’ according to all criteria and that the state is exempt from responsibility for it.